The more humanity strays from its origin, the more we deny our bond with nature, the farther from perfection we become. We are the only creatures on the planet that use symbols in reference to something else. This documentary shows that we use symbols for absolutely everything the mind can conceive of. There is at least one word or icon or gesture to insinuate everything our five senses can detect and then some. But along with this beautiful gift comes a flaw. Propaganda is a tool widely used by those holding positions in many facets of society, from politicians, religious leaders, agents of the state to corporate brass. 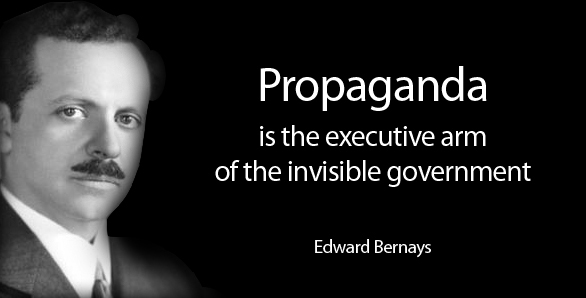 Edward Bernays, who is considered “the father of public relations”, penned his magnum opus Propaganda originally published in 1928. This particular piece of work is dynamic because this book details how the mass manipulation of the human subconscious can place. In a world where the propaganda vice-grip has reached unfathomable levels, knowledge of the form in which this takes place is not only imperative, but an individual responsibility. Although glossed over by many, propaganda in it’s many forms – news, tv shows, songs, radio stations, advertisements, magazines, and more – has become an undeniable part of our society structure. Webbing the populace at will, this tool, and all its functions, have served to greatly increase the influence/power of most individuals and institutions spreading it. Propaganda, in it of itself, is not negative per se. However, if lies are embedded within the messages being shared, then this tool can have very nefarious and wide reaching consequences for entire populations. The book’s strength lays in showcasing the methods being studied by Bernays nigh a century ago, and how those methods were or might be employed. Simply stated, if one wishes to understand how the rulers of our time operate and how they use and extend part of their power, then Propaganda is for you. Personally, this book should be mandatory for anyone’s education. Only by knowing what you face and how it is employed can one learn how to overcome it. Because remember when merely associating with Nazi war criminals was enough to get you thrown out of polite society in perpetuity and likely thrown in a US prison, or worse? Well, when the one doing the association is that creature of utmost “fluidity” when it comes to matters of morality, the US government, apparently preaching moral superiority while invading and targeting for extermination world “dictators” whose only crime is being “evil” according to the US government’s pristine moral compass, then everything is forgiven. But before the truth is revealed there will be years of denying, misrepresenting the facts, and outright lying. They believed the ex-Nazis’ intelligence value against the Russians outweighed what one official called “moral lapses” in their service to the Third Reich. And there it is: moral lapses. When the market crashes, and the US economy’s long-deferred collapse is now a fact, prepare to hear much more about the so-called moral lapses of bankers, Federal Reserve officials, and tenured economist during the upcoming public tribunals. In this News & Views from the Nefarium episode, author and researcher Joseph P. Farrell covers the death of the CEO of french-oil giant Christophe de Margerie in detail and its possible ramifications. The clip below shows how blatantly obvious the system is rigged. And yet, people still refuse to wake up. If one tells people the truth about the Federal Reserve & Central Banks and who’s behind them, they say its all ‘conspiracy.’ The Main Stream Media Presstitutes tells them the truth, and THEN it’s believable and thus, “true.” [Insert an overwhelming eye roll here please]. This is getting so ridiculous, its almost funny, almost. Except we’re dealing with people who control the United States money supply [never mind the fact that its the World Reserve Currency!] through the Federal Reserve by proxy. Due to that, this is no laughing matter. The Rothschild’s & their cohorts, who control the Federal Reserve and many other corporations, have been enslaving humanity with their web of debt – and countless books show the evidence of this – for nigh three centuries. Maybe this year, maybe soon, maybe now people will not only wake up, but actually begin to care? Almost all of the wars are false flags based on false premises and have been blatantly staged. Millions have died worldwide over time. All so a handful of old puppeteers can literally have their way with us. 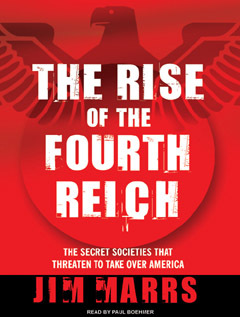 We are, and have been ruled with iron fists for far longer than most can imagine. Countless wars have been carried out for profit, to consolidate wealth and to further globalization. It’s not that hard to learn who the people behind the curtain are, and what they wish to accomplish. And what the Rothschilds & other central bankers wish to accomplish is actually vastly more nefarious then just wealth consolidation through theft and other means. That is only the tip of the iceberg. For now though, take a gander below, and decide for yourself what your next step is going to be. You are currently browsing the archives for the Secret Societies & Ruling Families / Global Elite category.